An Static Induction Thyristor or SI-thyristor is a self-controlled GTO-like on-off device commercially introduced in Japan in 1988. Similar device, known as field-controlled thyristors (FCT) or field-controlled diode (FCD), were developed in USA. The device symbol is shown in Fig. 11.10. It is essentially a P+ NN+ diode. Similar to SIT, SITH is a normally on device with the N-region saturated with minority carrier. The turn-off behaviour of SITH is similar to that of GTO. It is a self-controlled GTO-like high power device (1200 V, 800A). Its general comparison wih GTO is given below. 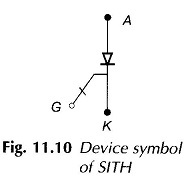 1.Unlike GTO, SITH is a normally on device-asymmetric blocking. 4.The switching frequency is higher (tON = 2 μs,tOFF = 9 µs) and has lower switching losses. 5.The dv/dt and di/dt ratings are higher. (2 kV/μs, 900A/μs. 6.The SOA is improved and Tj is limited.